Sit back and relax after a long day on this casual reclining loveseat. With soft backs and overstuffed pillow arms, this loveseat is the ultimate in luxury. Perfect for any living room, den or entertainment room. A built-in console provides room for storing clutter and holding beverages. Choose from a wide variety of fabric and leather upholstery options to customize the look of this couch to fit your home. 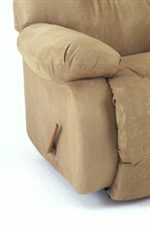 Available with power or manual recline mechanism, as well as space saver and rocker recliner models. The Brinley 2 Power Space Saver Console Loveseat with Power Tilt Headrest by Best Home Furnishings at Best Home Furnishings in the St. Louis, Chesterfield, St. Charles, MO & Waterloo, Belleville, Edwardsville, IL area. Product availability may vary. Contact us for the most current availability on this product.